It wasn't an ordinary Wednesday afternoon for me, last week I got to take a day trip down to Lake Cumberland State Park for a lunch previewing the new Better in the Bluegrass Culinary Tourism Initiative with the Kentucky Department of Tourism and Kentucky State Parks. The afternoon was warm and sunny, and the state park was the perfect setting with amazing views of Lake Cumberland from every angle! The purpose of the event was to kick-off the new Kentucky State Parks Culinary Trail (more on how to participate in that below), taste some of the amazing signature dishes that had been thoughtfully planned and prepared to represent each region of Kentucky, and overall just promote the impressive and ever-evolving food scene we have here in Kentucky. Kentucky is heaven for any tourist. We have horses, bourbon, basketball and beautiful country. What many people don’t see is the unique food that Kentucky offers. Kentucky is so regional that we have incredible variation in food across the state. Many of us from Kentucky grew up traveling out of the state on vacation, but I’m realizing that Kentucky has so much to offer, we could spend our next 2 years of vacations traveling around Kentucky and never catch everything the state has to share. I’m very excited that we are giving people an incentive to visit the 9 distinct regions of Kentucky to find the most amazing food in each section. With the recent announcement that the latest season of Top Chef is to be filmed throughout Kentucky, it is obvious that our culinary scene and food culture is getting noticed. I personally was super excited to take part in this event because I love checking out other regions and cities of Kentucky and learning about the history of our state. This allowed me to sample a little taste (literally) of each region as well as learn the history and culture behind each menu and set of dishes. I’m very excited that we are giving people an incentive to visit the 9 distinct regions of Kentucky to find the most amazing food in each section. 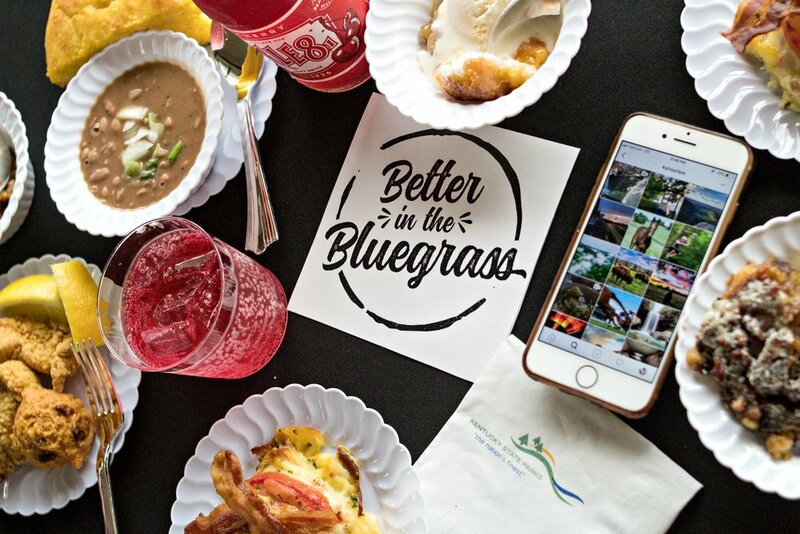 The Better in the Bluegrass campaign encourages visitors to experience signature dishes from 9 different regions of Kentucky. 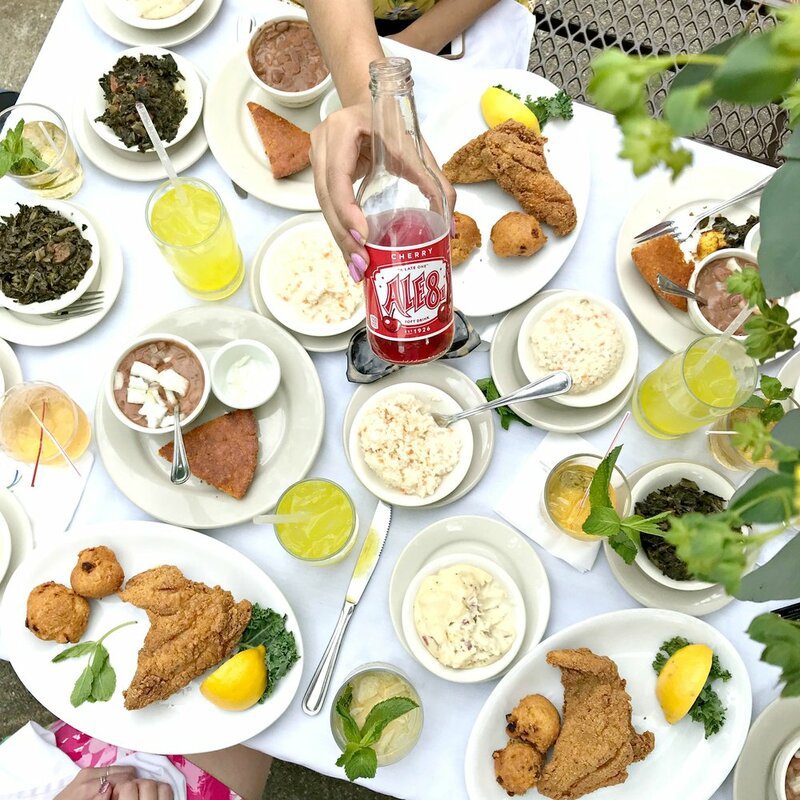 Each of these regional meals has been carefully put together by a team of chefs, historians, farmers, and food producers to perfectly represent that specific region of Kentucky. It's also super easy to try them all because all the meals will be available through the summer, each at a different Kentucky State Park. You can find all the details on how to follow the trail and complete your own "culinary passport" below! At the preview event, we got to taste 1-2 dishes from each region and they were all SO delicious! You can check out some preview photos, more details on menus, and what state parks to find them all below as well. My favorites were the tomato pie from the Northern Kentucky River region and the fried catfish from the Southern Shorelines region. The menus also include a beverage and dessert for each region in addition to the appetizer, entree, and sides. This is such a fun excuse for exploring Kentucky this summer and checking out some regions you might not normally travel to. Many of these places make an easy day trip, while others are perfect weekend getaways. Be sure to follow the three easy steps below to complete your Culinary Passport and get a fun gift! Step 2: Take your Culinary Passport to any of the participating nine state parks. Savor the regional meal offered there, then get your passport stamped. Check out a sneak peek of some of the regional dishes I got to try at the event below! You can also check out a quick list of each of the nine menus offered at our Kentucky State Park restaurants. I don’t think it gets more “Kentucky” than a hot brown. Of course every time someone visits from out of town, we almost force them to eat a hot brown (the third and fourth hot browns they consume are totally voluntary once they taste the first)! This hors d’oeuvres take on the hot brown maintained the richness and full flavor of the hot brown but on a crunchy toast point with the brightness of the tomatoes front and center. Tomato pie is on the table at every one of Alex’s family functions. Any special occasion is accompanied by this decadent, cream and cheese based side. Make no mistake about it, the tomato is the star of the dish but bacon, cream and cheese are a high-brow supporting cast. Everyone who hasn’t had it looks at you funny when you bring it up, everyone who has had it immediately craves it at the same time. Alex went back for 3 helpings at the Lure Lodge at Lake Cumberland (shhh don’t tell the event organizers). Banana pudding is such a southern staple and you just know Kentucky is going to make it better than anyone else! Simple is oftentimes better and the dish served was a perfectly prepared and executed banana pudding like your grandmother would make. Growing up in Lexington, I didn’t know that Ale-8 was a local treat and not available in other states. Traveling around the southeast I soon realized that the rest of the country was missing out! Having a drink so ingrained in our culture is something I have realized is rare and we are lucky to have Ale-8 call central Kentucky home. Alex certainly enjoyed the cocktail that was made with Maker’s Mark bourbon, Ale-8 and fresh mint, all ingredients that are central to the Bluegrass region of Kentucky. Coming from the city that hosts the International BBQ festival each year, I expected to have really good BBQ but did not expect such a unique dish! The Burgoo was a hearty, flavorful stew with a history deeper than it’s flavor. When Alex was in college, he had a burgoo cookoff Derby party because neither of us could think of anything more Kentucky and the dish prepared by the chefs on Wednesday would have won the competition in a walk. The pairings of beans and peach cobbler for dessert made this region’s dish sinfully good and well worth the trip! The salmon cakes were crispy on the outside and warm and fresh on the inside. They came with a tartar sauce (you know Kentuckians aren’t eating anything without sauce!) which was a perfect compliment to the warm richness of the salmon. Beans, cornbread and chowchow are on Alex’s list of favorite food items anytime. He puts chowchow on just about everything he can; hot dogs, chili and any other meat is fair game. The chowchow served by the Kentucky chefs was perfectly balanced between sweet and tangy like any good relish product should be. The bright foil that our relish provided to the rich, sweet beans was welcome and showcased that Kentucky flavors are better together. I have always assumed I didn’t like catfish until I tried the catfish on Wednesday. The cornmeal crusted cat fish tenders were perfectly salty and crunchy and made it a welcome surprise as one of my favorite dishes on the menu. You already know I love a good meat and cheese platter! Kenny’s cheeses are a main component in many of those Charcuterie boards! An assortment of cheeses was offered at Wednesday’s event and they showcased the broad spectrum of cheeses that are available from our great state.